Want to learn what the optimal muscle building diet looks like? Read this article. When it comes to building muscle and adding size to your frame, your diet is going to be the most important factor that you have to get right. You can put in all the effort you want in the gym, but if your diet isn’t optimized for building muscle then you aren’t going to see the results you’re after. In fact, this is exactly why so many gym-goers get stuck spinning their wheels in the gym. They neglect the most important aspect of transforming their bodies… Nutrition! When your diet is optimized for muscle growth, it will enable you to perform that much better in the gym and physically recover and progress that much faster. But what exactly does a diet optimized for muscle growth entail? Well, let’s start with the basics. …and it also by no means requires you to explicitly stick to eating chicken, broccoli, and brown rice everyday. BUT – there are a few factors you need to get right. Which, are primarily how many total calories, protein, carbs, and fats you’re consuming on a daily basis. So let’s dive into that before taking a look at a sample meal plan for muscle gain. If you want to maximize muscle growth while minimizing excess fat gain, then you have to ensure you’re intaking enough calories…. …but at the same time you don’t want to go overboard with it. In fact, research has indicated that more is not necessarily better for growth. Since your body has a limit to the rate at which it grows new muscle, this will cause the rest of your excess (unneeded) calories to be stored as fat. Therefore I’d go with the recommendations of multiple researchers within the field, which is to aim to slowly gain roughly 2-4 lbs per month depending on your training experience. Multiply your bodyweight in lbs by 15 and then add 200-400 calories to this. 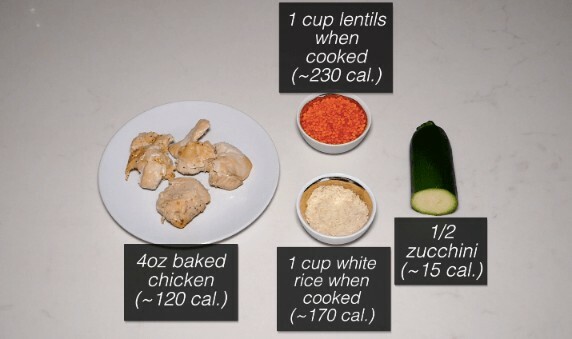 This will be the daily calorie intake you’ll need to eat at in order to add new muscle most efficiently. Keep in mind that beginners should aim for the higher end (e.g. 400 calorie surplus) since they have greater muscle growth potential. Whereas intermediate lifters should aim for the lower end (e.g. 200 calorie surplus). Although this likely won’t be spot on initially, you can start with this then adjust your calories based on how your weight gain progresses. As for protein, again, more is not necessarily better. However, there is an optimal range you want to hit given that it plays a vital role in muscle recovery and growth. As for what this range is, based on this 2018 meta-analysis from the Journal of Sports Medicine, intaking roughly 0.73-1 g per lb of bodyweight seems to be optimal for muscle growth. Note that going over this range doesn’t seem to provide an added benefit for growth. But in the event that you do, just know that research shows that it’s completely safe to do so given that you have normal and healthy kidney function. You need sufficient carbs in order to fuel your workouts and boost your performance in the gym. But you also need sufficient fat to support your hormone levels and overall health. As for how much of each, the literature recommends to intake roughly 0.25-0.5g of fat /lb of bodyweight. 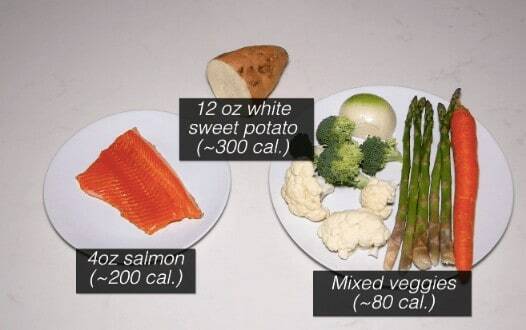 And then the remainder of your calories, minus protein, from carbs. Therefore you have a lot of flexibility with your carbs and fats and can adjust them to better suit your lifestyle and food preferences. Now if you’re confused about figuring out all of the above numbers, an easy way to get started is to simply use the macronutrient calculator below. Enter all the required information but make sure you set your goal as “muscle gain”, meals per day to “all”, and adjust protein to “high”. This will just ensure that its calculations are in accordance to the research I previously went through. Again, this calculation won’t be 100% bang on. The downside with all macronutrient calculators like the above is that it’s simply an estimate. It’s going to take some tweaking and adjusting on your end based on how your weight responds in order to find your “sweet spot” in terms of your calorie intake. But that’s exactly why I’ve developed my own nutrition software that calculates and automatically adjusts your calorie/macro intake based on how your weight progresses throughout the weeks. Meaning that it’s capable of pinpointing exactly how much you should be eating at in order to build lean muscle most effectively. It’s what I personally use to guide my nutrition and it’s what all my students/clients use as well. So if you’re interested in using this, it’s included in all 4 of my programs which can be viewed here. 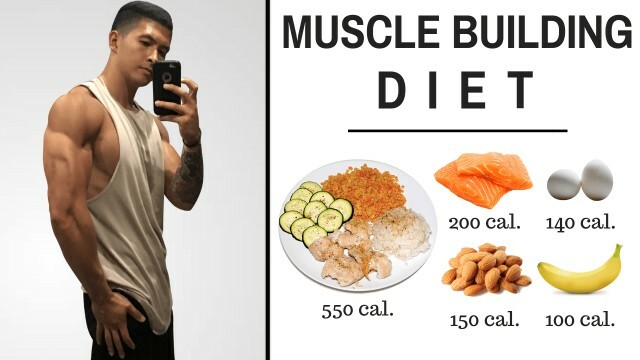 Now that you’ve learned the basics of setting up and optimizing your diet for muscle growth, let’s take a look at what a typical day of eating (or “muscle building meal plan”) could look like for you. Given that the average male needs roughly 2,500 calories to maintain their weight, we’ll aim for an intake of around 2,800 calories – and this 2,800 calorie intake will be spread across 4 main meals. In order to maximize muscle anabolism, your daily protein intake should ideally be spread across a minimum of four meals throughout the day. So with that being said, let’s start with meal 1. I find that a very easy and convenient way to intake a lot of calories and nutrient dense foods is to simply blend them into a shake. And in fact, as shown in this literature review, intaking liquid calories seems to impact satiety (the feeling of fullness) less than intaking the same amount of calories in solid form. Therefore, for those struggling to intake sufficient calories to gain weight, this shake is an excellent and convenient option. Simply blend it all up (add some ice if you wish) and this will by far be the easiest and most affordable way to make a big dent in your daily calorie intake without having to resort to eating junk. For the next meal, something like the following would be a great option. It contains adequate protein and sufficient carbs which will help fuel your workout later on. One of the great things about this meal is the varied amino acid profile of the foods. For example, lentils on their own are a great source of protein. However, they do lack in two important amino acids. But the good thing about pairing it with rice is that grains are particularly high in these two amino acids that lentils lack. Which is especially beneficial if you’re vegetarian or vegan and can’t have the chicken in this meal. As a mid-day snack, one great option is almonds or any form of nuts. They’re not only a great nutrient-dense source of healthy fats and fibre, but also provide a variety of other important micronutrients and minerals. Just be cautious of your serving size and not to overeat them as they are very calorie dense, so measuring/weighing out your portions would definitely be recommended. And for those interested, you can view the scale I personally use and recommend here. 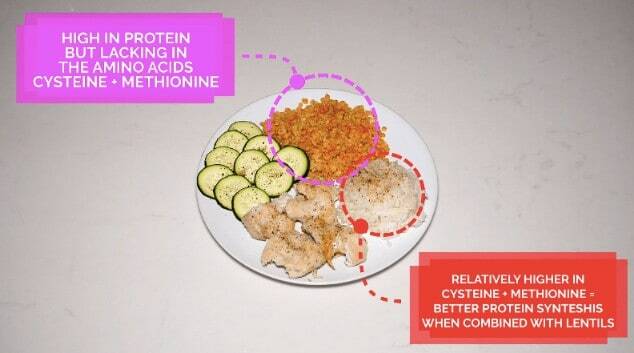 Although this food combination may be a little weird for some of you, it’s a great option as a go-to pre-workout meal. This is because multiple studies have indicated that ingesting protein and carbohydrates pre-exercise produces significantly greater levels of muscle protein synthesis – with high glycemic carbs such as rice cakes likely being the better option for performance. Ingesting whole eggs produced 42% greater levels of muscle protein synthesis than ingesting the same amount of protein in egg whites alone. Therefore, pairing your egg whites with whole eggs as done here may be more beneficial for this reason. Now as your post-workout meal to finish off the day, this meal is a great option. The salmon provides not only sufficient protein but also the all important omega-3 fatty acids DHA and EPA. And these two fatty acids have recently been shown in a 2018 literature review to possibly help with anabolic signalling, muscle repair, and muscle growth. The sweet potato serves to replenish any glycogen that was depleted during your workout. And lastly, the stir fry of veggies is just what I personally find to be the easiest way to up your micronutrient and overall vegetable intake for the day. 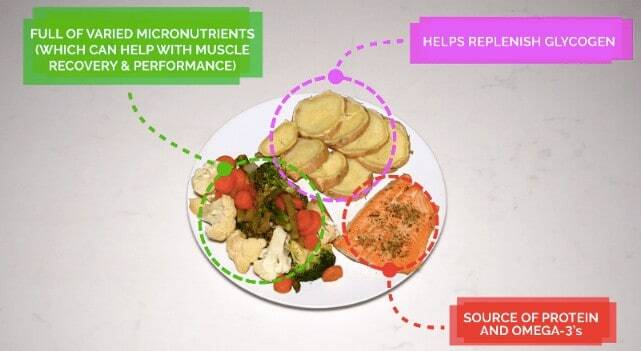 This is important because not only do micronutrients contribute to overall health and longevity, but they also do likely play a role in muscle recovery and performance. Something I’ll touch on in a future article! And that’s pretty much what a full day of eating for muscle growth could look like for you. Hopefully this provides you with some insight as to how to approach and optimize your diet when it comes to building muscle. The key really is to not only incorporate foods you personally enjoy but also foods that are simple and easy to make, as that’s exactly what will enable you to stick with it in the long run. And these are all things that don’t go overlooked in my complete evidence-based programs. Within these programs, nutrition is given a high priority – because I know just how much it influences your rate of progress. So if you’re ready to transform your body in the most efficient manner possible, check them out and join the Built With Science family! Anyways, that’s it for this article! Feel free to let me know in the comments if you have any questions/concerns that I can help out with. And if you haven’t already, don’t forget to show me your support by giving me a follow on Instagram , Facebook , and Youtube where I’ll be posting informative content on a more regular basis. Thank for your help for struggling gym enthusiasts. Are the oats and eggs cooked or not? I just noticed that in the macro nutrient calculator in the standard measurement is says “Height(feet)” where feet and where inches should be, instead of indicating that the second box is for inches. We all make typos don’t worry! How soon after your weight training workout do you wait to eat or have a protein smoothie? I hear immediately after or up to 60 minutes. Which is best according to the science. 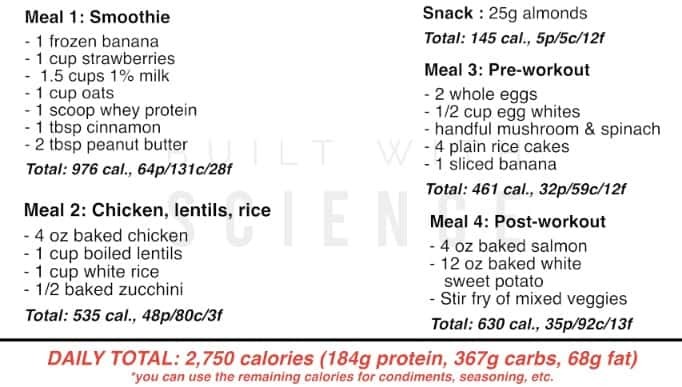 Hi, for meal one, how did you get 64g of protein out of your ingredients? As I only got 56g of protein. There is roughly 1000 cal difference when you manually calculate intake vs. using the calculator…. Which is better option? Usually, I really like your articles and this one was no different. However, the macro calculator seems to be way off. It had me at 411 and grams of protein per day and 4000 plus calories. Based on the ruff formula you gave me I would have fallen into the 187 grams of protein per day adn 3200 calories on the high side. I think the calculator thinks I am The Rock.